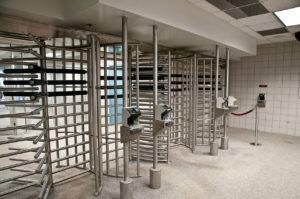 This month we reviewed Access Control Turnstiles, and the role they can play in your facility. From this Guide to Access Control Turnstiles to these tips on How To Choose the Right Access Control Turnstile for your Facility, Bulldog Fire and Security has you covered through every step of the process. Bulldog Fire and Security have been installing Access Control Turnstiles in Southwestern Ontario for 19 years, and we continue to be impressed by the great selection of products from Automatic Systems. 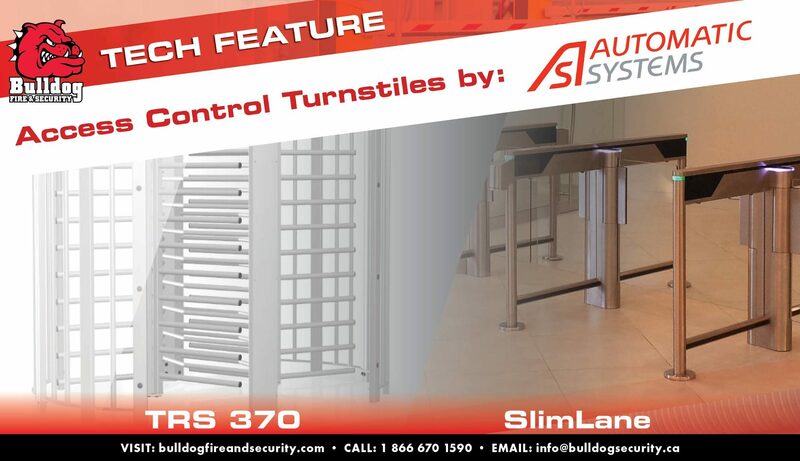 In this article, we will look at two specific applications: the TRS 370 Full Height Turnstile, as well as the SlimLane security entrance lanes. The TRS 370 Full Height Turnstiles by Automatic Systems are primarily used outdoors as part of a perimeter security system, and can commonly be found at sporting facilities, industrial sites, and airports. A full height turnstile is a basic but effective method to control access into your facility. The TRS 370 averages a throughput of 15 people per minute and has an incredible lifespan with a MCBF of 1 million cycles. One of our favourite features is that it is compatible with most access control systems and provides the user with many configurations for passage management. The structure is made of rust resistant galvanized steel that is suitable for intensive operation under harsh weather conditions. 3-arm mobile obstacle. Each arm is a comb made of steel tubes attached to a rotating wheel disc. Fixed panel enables single passage without the need of supervision. Control board access through integrated keyboard and LCD screen or Modbus link with remote control. Automatic Systems offers many alternatives in the SlimLane series, with the primary goal of providing strong access control within a small space. All models offer a modern design that includes a card reader, and tempered glass barriers. The SlimLane optical barrier turnstile is ideal for high-traffic locations with a fast open/close swing and a 10 Million MCBF. The SlimLane also comes with an industry leading 5 year warranty and is UL 2593 certified.This model is a great solution for banks, government, and office buildings. Steel construction ensures durability. The stainless steel handrail includes a proprietary DIrAS detection system using photoelectric cells for user detection and the logic control board. Clear, 3/8″ thick tempered glass obstacles, which all for bidirectional throughput. Many different housings to integrate seamlessly within your environment. 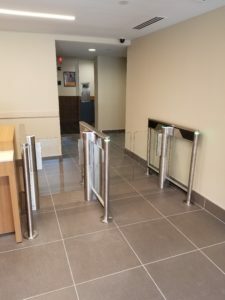 For 19 years, Bulldog Fire and Security has been an expert in Access Control Turnstile installation, having installed a variety of Access Control Turnstiles across Southwestern, Ontario. To schedule a no obligation assessment of your facility’s Access Control Turnstile needs, call us at 1 866 670 1590, email info@bulldogsecurity.ca, or fill out the contact form below.